Rust-Oleum Mathys Dac Hydro Alu is a waterborne, ready-to-use aluminium coating for decoration, heat reflection and lasting protection of metal and most bituminous roofs. It has excellent resistance to extreme weather and temperature fluctuations. 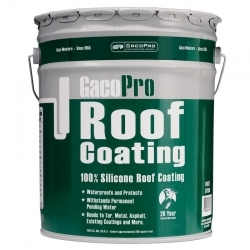 400% elastic, water vapour permeable it builds an abrasion resistant, rubberlike coat without joints or seams for a wide range of roof surfaces. 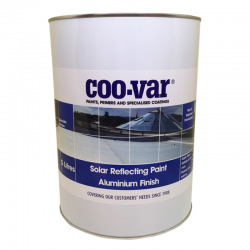 Rust-Oleum Mathys Dac Hydro Alu is a solar reflective roof paint based on water dispersed acrylic resins providing a decorative aluminium finish that offers durable protection for roofs with solar reflective characteristics. Rust-Oleum Mathys Dac Hydro Alu is 400% elastic, water vapour permeable and prevents strong warming up of the surface locally by the light reflecting effect of the pigments in the coating film. 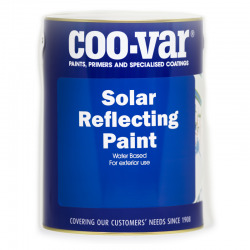 It keeps its aluminium finish even in strongly varying atmospheric conditions (U.V. rays, water, strong temperature fluctuations, etc.) and is recoatable. Rust-Oleum Mathys Dac Hydro Alu is builds an abrasion resistant, rubberlike coat without joints or seams for a wide range of roof surfaces. The substrate must be clean, free from peeling, dust and dirt. Bridge cracks and fissures with Rust-Oleum Mathys Dacfill Fleece. Fill up joints with Rust-Oleum Mathys Elastofill. Very porous substrates have to be primed first with Rust-Oleum Mathys Primer 44 HS. 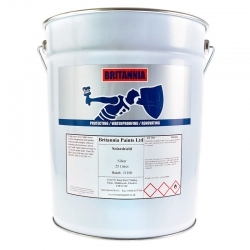 Rust-Oleum Mathys Dac Hydro Alu can be directly applied on metals (except new galvanised steel), roofing and most bituminous products (> 1 year). 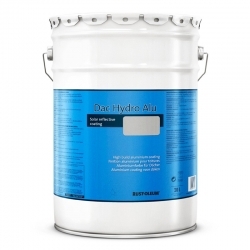 Rust-Oleum Mathys Dac Hydro Alu can be applied without any problem on most waterbased products like Rust-Oleum Mathys Dacfill Waterproofing and Rust-Oleum Mathys Noxyde. Do not apply directly on Rust-Oleum Mathys Fillcoat or Rust-Oleum Mathys Fillcoat Fibres. 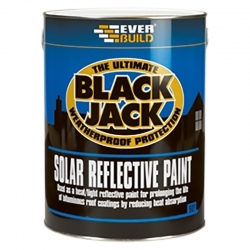 In this case it is necessary to apply first a coat of Rust-Oleum Mathys Dacfill Waterproofing. Rust-Oleum Mathys Dac Hydro Alu cannot be applied on flexible PVC, EPDM, tar or bituminous materials < 1 year, polyisobutylene and smooth bitumen-polymers. In case of stagnating water, Rust-Oleum Mathys Dac Hydro Alu must always be applied in combination with the Rust-Oleum Mathys Dacfill Fleece with a consumption of 2 litres per m². Airless spray: In case of airless-application, the aluminium finish will not be uniform; an airless-roll application is ideal, although in case of an airless application, it is necessary to roll over the surface with a roller. Apply in good drying conditions at minimum 5°C.